Houston was named after John Houston, a colourful British Columbian politician and newspaperman. John Houston never lived in this town, but his name was chosen in a contest. Until the contest in 1910, this town was known as "Pleasant Valley". 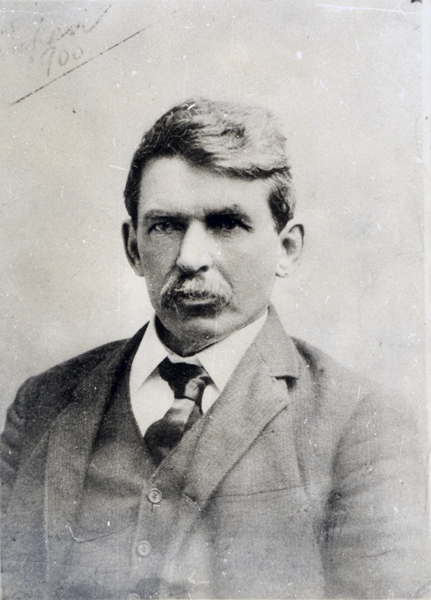 John Houston was born in November 1850 in Alton, Ontario and grew up in the east. Restless, he travelled west, and after he came to British Columbia he became active as a politician and as a journalist. He was a good public speaker with a large and colourful vocabulary. From 1897 to 1905 he was the mayor of Nelson, British Columbia, and in 1900 he was also elected to the British Columbia legislature, where he served for two terms. He became known throughout British Columbia as a newspaperman, publishing papers in Donald in 1888, then in New Westminster, Nelson, Rossland, and in Prince Rupert (this is where John Goold met Houston in about 1908). Never one to sit still, John Houston in 1909 established the Fort George Tribune to publish all the land claims that were taking place in what we now call the Prince George area. There he became ill - there are reports of "driving himself till he cracked" - and was taken to Quesnel for medical treatment. Houston was accompanied to Quesnel and assisted by his friend Mr. J. W. Cooke, who was a landowner at Fort George. Houston died of heart failure at 3:30 p.m. on March 8, 1910. He was 59 years old. The Province newspaper reported his death before the actual event. Houston, always witty to the end, read the report and is alleged to have responded, "I didn't know I was dead until your paper came out, and even then I might have questioned the accuracy of the information if I hadn't known it's reliability. Don't be putting in any correction...I'll make good on the story." And he did, passing away shortly thereafter. His wife, Edith May Keeley, formerly of York County, Ontario, (of whom little is known except that she was loyal to him despite his fiery unpredictability and frequent absences), left Vancouver upon hearing of his illness, but was unable to reach him before he died. We do know that there was a child born to the Houstons before his death. Mrs. Houston is pictured with a little girl, about four years old, and there are stories of gala socials at the Houston mansion in Nelson. She remarried after his death. Houston's body was taken by horse and sleigh to Nelson, British Columbia, where it was laid to rest. A memorial has been erected in his honor in the centre of Nelson. John Houston never lived in Houston, maybe never even set foot here, but his name was chosen in a contest in 1910, more to commemorate the life of a colourful British Columbian newspaperman and politician than to rename what was already known to the locals as "Pleasant Valley."